Last year memory researchers John Wixted and Laura Mickes wrote on ScientificAmerican.com that while eyewitness testimony is widely considered unreliable evidence (eyewitness misidentifications have been shown to be involved in a whopping 70 percent of 349 wrongful convictions), we shouldn’t throw the baby out with the bathwater. Eyewitness testimony collected under certain circumstances could still be invaluable. The trick about memory is that sometimes it’s reliable and other times it’s not. Memory is malleable. Remarkably, discovery has only slowly progressed about how memories form in the brain, why certain memories are stored over others, and what preserves the integrity of those individual memories. In this issue’s special report, we’ve included the latest findings on the tools researchers have devised to get at these questions. As Helen Shen describes in “Portrait of a Memory,” scientists are refining their techniques to decode discrete memories with increasing precision, producing “engrams,” images of brain activity. 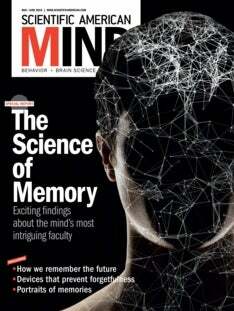 Investigators Matthias Kliegel and Nicola Ballhausen explain in “Foresee and Forget: How to Remember the Future,” a fascinating area of research on “prospective” memory—that is, memory used to recall things that need to be done in the future—a vital skill for planning your day’s activities. And Dana G. Smith reports in “Brain ‘Pacemaker’ Could Help You Remember Only What You Might Forget,” on a new technology that might stimulate the brain to summon up something it seems to have forgotten, in case your prospective memory is lagging on that particular day. As always, enjoy and let us know what you think!